The Fenton Arts Trust is a charity which focusses its efforts specifically on the support of artists at the beginning of their careers. Each year there are approximately twenty five to thirty beneficiaries. If you are thinking of making an application, please help us by reading carefully the What we support and Applying for a Grant pages. Doing this should increase your chances of success and save wasted effort. By minimising our administrative costs we aim to maximise the amount of money that we can disperse. 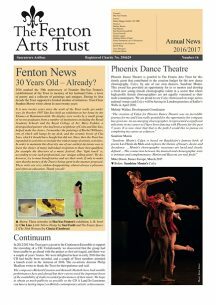 Our Fenton Arts News page has links to our past Newsletters – the latest here on the right. For detailed records of our support of the creative arts over the years see the Previous beneficiaries page.